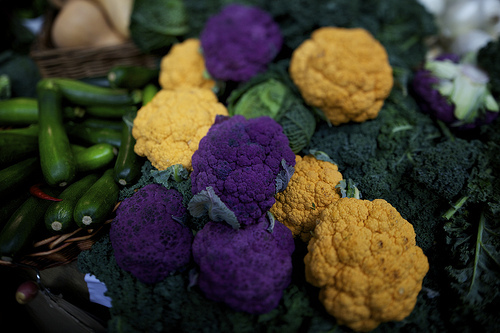 Ccauliflower is one of my all-time favorite vegetables. 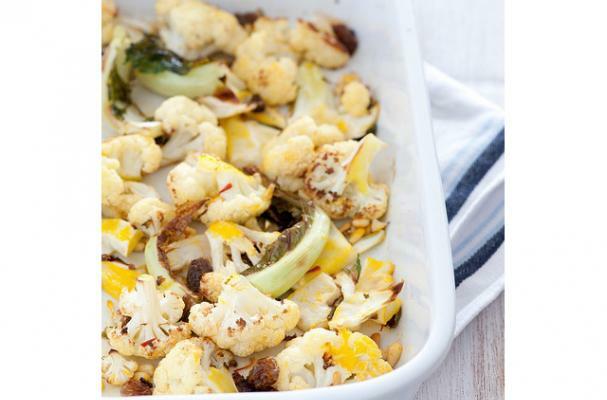 Not bland and boring as some recipes (ahem, steamed or boiled) would lead you to believe, cauliflower is seriously healthy, versatile and delicious! (Did I mention it comes in awesome colors like orange and purple?!) Seriously, this recipe could not be any easier! Chop, toss, bake, chew, enjoy! This recipe is extremely allergy friendly: gluten free, milk/dairy free (GFCF) and vegan, also soy, corn, egg and refined sugar free! 2 apples, cored and diced - no need to peel! Cut your cauliflower into florets, discarding the woody stem. Line a baking sheet, roasting pan or casserole dish with parchment paper. Place cauliflower, onion and apple on the parchment, drizzle with olive oil and season with salt pepper. Bake for 40-50 minutes, stirring every 15 minutes, or until cauliflower is golden brown and apples are tender. Transfer roasted vegetables to a serving bowl, stir in the fresh dill and serve!